The purpose of this review is to update previously published reviews on exercise programming in exercise trials in prostate cancer survivors. We evaluated: 1) the application of the principles of exercise training in prescribed programs; 2) the reporting of the components of the exercise prescription; and 3) the reporting of adherence of participants to the prescribed programs. Building upon a previous review, a systematic review was conducted searching OVID Medline, Embase, CINAHL, and SPORTDiscus databases from 2012-2017. Randomized controlled trials of at least four weeks of aerobic and/or resistance exercise in men diagnosed with prostate cancer that reported physical fitness outcomes, including body composition were eligible for inclusion. Specificity was appropriately applied by 93%, progression by 55%, overload by 48%, initial values by 55%, and diminishing returns by 28% of eligible studies. No study adequately applied the principle of reversibility. Most (79%) studies reported all components of the exercise prescription in the study methods, but no study reported all components of adherence to the prescribed intervention in the study results. Application of standard exercise training principles is inadequate in exercise trials in men with prostate cancer and could possibly lead to an inadequate exercise stimulus. While many studies report the basic components of the exercise prescription in their study methods, full reporting of actual exercise completed is needed to advance our understanding of the optimal exercise dose for men with prostate cancer and promote translation of controlled trials to practice. Prostate cancer is the most commonly diagnosed cancer in men in developed countries, such as Canada, and is one of the most treatable cancers, with five-year survival rates of 95% . Depending on the stage of disease, treatment options can range from active surveillance to radical prostatectomy, radiation therapy, androgen deprivation therapy, and sometimes chemotherapy . These treatments can have a number of deleterious effects on other health outcomes such as reduced bone mineral density, physical function, and quality of life, along with altered body composition (i.e., gain in fat mass and reduction in lean mass) [3, 4]. These adverse health outcomes are a direct result of cancer and treatment but may also indirectly result from a decline in physical activity that can occur during treatment . Previous systematic reviews have summarized the existing evidence for the role of exercise in improving physical fitness (i.e., strength and aerobic fitness), fatigue and lean body mass [4, 6], with resistance training appearing to be particularly beneficial in counteracting adverse changes in body composition . Observational studies have also suggested an important role for physical activity in reducing mortality after a prostate cancer diagnosis . Despite this evidence, there remains uncertainty around the most efficacious exercise prescriptions for improving specific outcomes across this heterogeneous population. This knowledge gap limits the translation of prescriptions from tightly controlled efficacy studies in a research setting to practice in the broader population of prostate cancer survivors who likely vary in their exercise capacity and may exercise in less supervised settings. In 2012 and 2014, our team published a pair of systematic reviews to evaluate the application of the standard principles of exercise training and to summarize reporting of and adherence to an exercise prescription in studies of breast cancer survivors  and in survivors of cancers other than breast . These reviews were prompted by our observation that well-established exercise training principles from the field of exercise physiology (Table 1 ) were either not considered in the design of exercise oncology trials, or were misapplied. In our reviews, and in a recently published update of our first breast cancer review , across 113 trials, none applied all of the principles of exercise training and only two [13, 14] reported all of the components of the exercise prescription in their methods and results. Since the publication of the 2014 review of adults with cancer other than breast, a large number of randomized controlled trials (RCTs) in prostate cancer survivors have been published, meaning findings from our last review may now be out of date. Treatments for prostate cancer, such as androgen deprivation therapy, are accompanied by unique side effects, and strong potential for exercise to mitigate these effects. Given that the high survival rate for prostate cancer results in a large population of long term cancer survivors, and the larger number of new trials in men with prostate cancer, a separate review focused exclusively on exercise in prostate cancer survivors could best inform the research field and clinical practice. The purpose of this review is to summarize the published literature on exercise studies conducted in men diagnosed with prostate cancer, with a particularly focus on evaluating 1) the principles of exercise training in the design of the exercise prescription; 2) reporting of the components of the exercise prescription (i.e., frequency, intensity, time and type, or ‘FITT’) in the study methods and 3) adherence of participants to the intervention prescribed in the study results. Using the same protocol as our set of previously published reviews [9, 10], and recently published update in studies of breast cancer survivors , Medline, CINAHL, SPORTDiscus and EMBASE databases were searched from January 1, 2012 to August 21, 2017. This search complimented our previous search (completed to December 31, 2011) of exercise studies conducted in survivors of all cancers, other than breast. 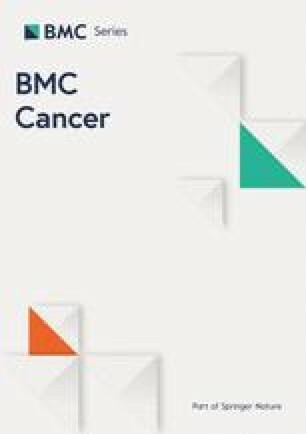 This review includes the seven papers from the original review  that included only men diagnosed with prostate cancer, and any new papers published between 2012 and 2017. The previous subject heading terms related to cancer (cancer, neoplasms, carcinoma) and exercise (exercise, physical activity, aerobic, resistance, walking, etc.) specific to each database were used and combined with the AND term. The search was then limited to English-language publications in peer-reviewed journals. Key publications, including relevant systematic reviews identified during the literature search were hand-searched for relevant trials. Included studies were conducted exclusively in men diagnosed with prostate cancer, regardless of treatment type or stage of treatment. Eligible studies were required to be RCTs with one or more treatment arms involving at least four weeks of aerobic and/or resistance exercise. Alternative forms of exercise, such as yoga, Pilates, or Tai Chi, as well as therapeutic interventions (i.e., physical therapy, stretching) were excluded. Studies that focused primarily on physical activity behaviour change and those that only reported levels of physical activity or psychosocial outcomes were excluded. In line with our previous criteria, all studies were required to report at least one relevant physiological outcome related to exercise (e.g., aerobic capacity, muscular strength, physical function, or body composition). Secondary publications from previously included trials were added to the database of included articles to allow for review of previously extracted data and updates regarding inclusion of information on use of exercise training principles, exercise prescription or adherence to exercise prescription data but were treated as singular studies. Two reviewers (SNS and MM) independently determined eligibility using an online software system (Covidence Systematic Review software, Veritas Health Innovation, Melbourne, Australia). Each reviewer first inspected the title and abstract of each study and full-text versions of relevant papers were obtained and further reviewed for eligibility. Discrepancies were resolved by consensus and the input of another member of the study team (KWS) when required. All relevant data were extracted using the online software system, in duplicate, with discrepancies resolved by consensus. Data extracted included sample size, timing of intervention delivery (during or after treatment), treatment type, intervention delivery mode (supervised or home-based), intervention duration, timing of follow-up measures, primary and secondary outcomes, and study findings. The exercise prescription was abstracted according to the ‘FITT’ format from each publication’s methods section, including frequency (number of sessions per week), intensity (relative or absolute intensity of exercise), time (duration of exercise) and type of exercise. For every described exercise prescription, the two reviewers independently assigned a rating for the use of each principle of exercise training (see Table 1). Application of a principle was assigned a ‘+’ when the application was clearly reported and an ‘NR’ (not reported) if there was no indication that the principle was used in the exercise prescription. A ‘?’ was assigned when the principle was mentioned but not described, inconsistently applied, or otherwise unclear. Adequate reporting of the prescription according to the FITT format, and participant adherence to the prescription was also assigned a ‘+’, ‘NR’ or ‘?’. For multi-arm trials comparing different exercise interventions, the application of the principles of exercise training, and the exercise prescription was evaluated separately for each intervention arm. For trials that were previously included, newly identified articles were screened for new information, to determine whether the previously assigned ratings should be altered, but were not counted as another independent trial. As described previously, the number and percentage of studies that met each criterion for attention to principles of exercise training and reporting of exercise prescribed and completed was calculated and reported. Due to the small number of prostate cancer studies included in the first review, previously included and newly identified studies are presented together in this review. Due to the relatively small number of prostate cancer trials, we were not powered for comparisons of reporting patterns between studies in our first review (< 2012) and new studies identified in this review (> 2012). Thus, we present descriptive data only. Study identification, screening, and eligibility information is outlined in the PRISMA diagram (Fig. 1). In total, 41 papers were identified from our search and included here. Of these, there were 37 papers from 18 unique trials published after 2012, and four secondary papers [15, 16, 17, 18] from the seven trials included in our previous review [19, 20, 21, 22, 23, 24, 25], for a total of 25 included trials. Of the four new papers from previously included studies two reported on different outcome measures [16, 18] and the other two reported secondary analyses of original outcomes [15, 17]. After reviewing newly published papers from previously included trials, none of their ratings were changed from our previous review. Across included trials, seven (28%) prescribed aerobic exercise only [22, 25, 26, 27, 28, 29, 30], five (20%) prescribed resistance exercise only [23, 31, 32, 33, 34], ten (40%) prescribed combined aerobic + resistance exercise [19, 20, 21, 35, 36, 37, 38, 39, 40, 41] and three (12%) were multi-arm trials (seven intervention arms) comparing aerobic to resistance or aerobic + resistance exercise [24, 42, 43] (Table 2). The interventions themselves ranged from four weeks to two years in duration and consisted of either entirely supervised (n = 10, 40%) [21, 22, 23, 24, 30, 32, 34, 35, 38, 39], entirely home-based (n = 5, 20%) [25, 26, 27, 40, 41] or a combination of supervised + home-based exercise (n = 10, 40%) [19, 20, 28, 29, 31, 33, 36, 37, 42, 43]. Ratings of the principles of exercise training for all included trials are displayed in Table 3. No included trial reported attention to all six evaluated principles of exercise training. Only nine (33%) trials appropriately applied more than half of the principles (i.e., four or five of a possible six), eight (28%) trials applied half of the principles, and twelve (41%) trials applied fewer than half other principles (Fig. 2). Specificity was appropriately applied by three (43%) aerobic trials [22, 25, 28], all five (100%) resistance trials [23, 31, 32, 33, 34], nine (90%) combined trials [19, 20, 21, 35, 36, 37, 38, 39, 40] and all seven (100%) multi-arm trials [24, 42, 43]. Specificity was unclear in one (14%) aerobic  and one (10%) combined study . Three (43%) aerobic studies did not attend to the principle of specificity [26, 29, 30]. Progression was appropriately reported by three (43%) aerobic [27, 28, 30], all five (100%) resistance [23, 31, 32, 33, 34], three (30%) combined [19, 35, 40] and five (71%) multi-arm trials [24, 43]. Progression was unclear in one (14%) aerobic , and four (40%) combined trials [21, 36, 37, 39]. The principle of progression was not attended to in three (43%) aerobic [25, 26, 29], three (30%) combined [20, 38, 41] and two (29%) multi-arm trials . Across all studies, three (43%) aerobic [22, 27, 28], all five (100%) resistance [23, 31, 32, 33, 34], one (10%) combined , and five (71%) multi-arm trials [24, 43] adequately reported use of the principle of overload. One (14%) aerobic  and one (10%) combined study  were unclear in their application. The remaining three (43%) aerobic [26, 29, 30], eight (80%) combined [19, 20, 35, 36, 37, 38, 39, 41] and two (29%) multi-arm trials  did not report applying the principle of overload in the development of the exercise intervention. The principle of initial values was adequately reported within three (43%) aerobic [27, 28, 30], four (80%) resistance [31, 32, 33, 34], six (60%) combined [19, 35, 36, 38, 39, 40] and three (43%) multi-arm trials . Attention to initial values was not at all reported in the remaining four (57%) aerobic [22, 25, 26, 29], one (20%) resistance , four (40%) combined [20, 21, 37, 41] and four (57%) multi-arm trials [24, 42]. No trials were assigned an unclear rating for initial values. No included trial adequately reported attention to the principle of reversibility. Five (71%) aerobic [25, 26, 27, 28, 30], two (20%) combined [19, 37], and two (29%) multi-arm trials  were assigned an unclear for this principle. The remaining two (29%) aerobic [22, 29], all five (100%) resistance [23, 31, 32, 33, 34], eight (80%) combined [20, 21, 35, 36, 38, 39, 40, 41] and five (71%) multi-arm trials [24, 43] did not report reversibility at all. Finally, diminishing returns was reported by one (20%) resistance training trial , two (20%) combined trials [36, 39], and five (71%) multi-arm trials [42, 43]. Diminishing returns was unclear in five (71%) aerobic [25, 26, 27, 28, 30], one (20%) resistance , and two (20%) combined interventions [19, 37]. It was not at all reported in the remaining two (29%) aerobic [22, 29], three (60%) resistance [23, 31, 32], six (60%) combined [20, 21, 35, 38, 40, 41] and two (29%) multi-arm trials . Reporting of each component of the exercise prescription are displayed in Fig. 3a. Reporting of the components of the exercise prescription was generally high, with five (71%) aerobic [22, 25, 26, 27, 28], all five (100%) resistance [23, 31, 32, 33, 34], seven (70%) combined [19, 21, 35, 36, 37, 38, 39] and six (86%) multi-arm trials [24, 42, 43] adequately reporting all four components of the exercise prescription. Prescribed intensity was unclear in one (10%) combined  and one (14%) multi-arm trial  and was not at all reported in two (29%) aerobic [29, 30] and one (10%) combined trial . Prescribed duration of exercise was unclear in one (10%) combined  and one (14%) multi-arm trial , and was not reported in one (10%) combined study . Prescribed type of exercise was unclear in two (20%) combined studies [40, 41]. Reporting of adherence to the prescribed interventions, or actual exercise completed by participants is displayed in Fig. 3b. No studies adequately reported adherence to all four components of the prescribed exercise program. Two (29%) aerobic [22, 26], four (40%) combined [20, 36, 40, 41] and two (29%) multi-arm interventions  did not adequately report any component of adherence. Frequency of exercise completed was the most commonly reported component, with three (43%) aerobic [27, 28, 30], all five (100%) resistance [23, 31, 32, 33, 34], six (60%) combined [19, 21, 35, 37, 38, 39] and five (71%) multi-arm trials [24, 43] adequately reporting frequency of exercise completed. One (14%) aerobic , two (20%) combined [36, 40], and two (29%) multi-arm trials  were unclear in their reporting of frequency of exercise completed, and three (43%) aerobic [22, 25, 26] and two (20%) combined studies [20, 41] did not report adherence to prescribed frequency at all. Intensity of exercise completed was reported fully in only two (29%) aerobic studies [25, 27]. Adherence to intensity was unclear in three (43%) aerobic [26, 28, 30], two (40%) resistance [33, 34], and three (30%) combined studies [19, 35, 40]. Adherence to intensity prescribed was not at all described in the remaining two (29%) aerobic [22, 29], three (60%) resistance [23, 31, 32], seven (70%) combined [20, 21, 36, 37, 38, 39, 41] and all seven (100%) multi-arm trials [24, 42, 43]. Duration of exercise completed was only reported in one (14%) aerobic trial . Duration was unclear in three (43%) aerobic [26, 27, 28], one (20%) resistance , and three (30%) combined studies [19, 39, 40]. Duration was not at all reported in the remaining three (43%) of aerobic [22, 29, 30], four (80%) of resistance [23, 31, 32, 33], seven (70%) combined [20, 21, 35, 36, 37, 38, 41], and all seven (100%) multi-arm trials [24, 42, 43]. The type of exercise completed was fully reported by four (57%) aerobic studies [25, 28, 29, 30]. Adherence to exercise type was unclear in one (14%) aerobic , one (20%) resistance , and one (10%) combined study , and was not at all reported in the remaining two (29%) aerobic [22, 26], four (80%) resistance [23, 31, 32, 33], 9 (90%) combined [19, 20, 21, 35, 36, 37, 38, 39, 41] and all seven (100%) multi-arm trials [24, 42, 43]. 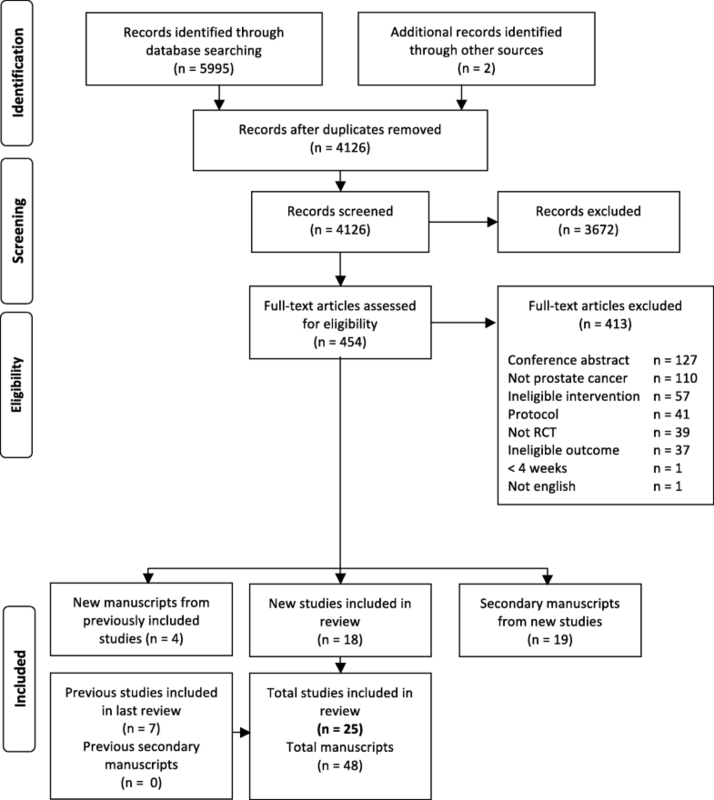 The papers included in this review of exercise programming and compliance in RCTs in men diagnosed with prostate cancer include data from 1891 men receiving various types of treatment for prostate cancer currently or in the past. The efficacy of exercise reported varied across trials and outcomes, but was generally positive; of the twenty papers that specified a primary outcome, 75% reported statistically significant changes in that outcome, and all but two trials found significant changes in at least one secondary outcomes. Consistent with our previous findings in women with breast cancer, reporting of adherence to the exercise prescription was poor. Without greater information on compliance to the exercise prescription, it remains unclear what exercise dose is actually needed to achieve desired outcomes mirroring those observed in the studies presented. No study reported all components, and three studies failed to report any indication of adherence. Frequency of exercise performed was most commonly reported, usually as a percentage of sessions attended in a supervised program or number of exercise sessions per week in a home-based intervention. This is not surprising given the relatively straightforward methods needed to collect this data. 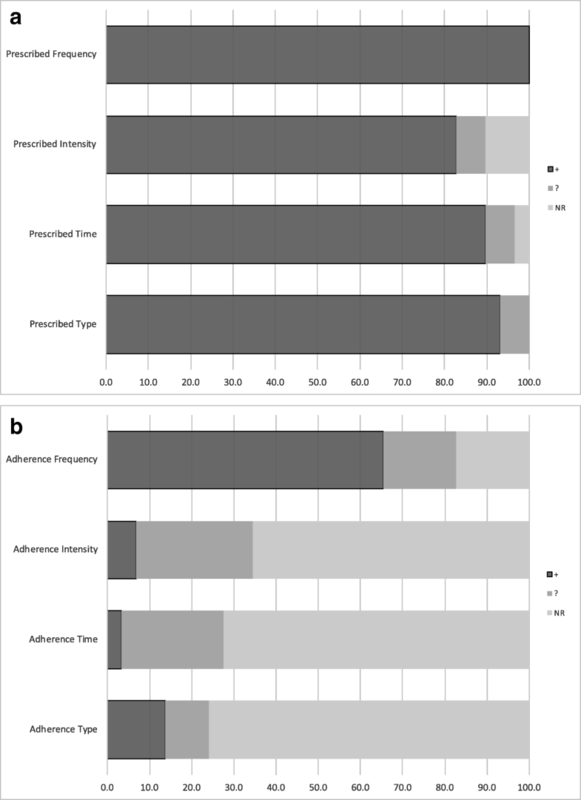 Reporting adherence to prescribed intensity may be more logistically challenging but is nonetheless important for replication and implementation. In an aerobic exercise intervention for example, average heart rate during an exercise session would require use of a heart rate monitor. Other methods, such as rating of perceived exertion (RPE) could be used if objective monitoring is not possible due to budgetary or logistic constraints. In addition to the actual FITT adherence, modifications needed to the exercise prescription, or the number of participants requiring substantial modifications would be interesting and important data to report. As found in our previous reviews of breast and all other cancer types, attention to the standard principles of exercise training was not strong across the literature reviewed. No studies included in this review appropriately applied all principles of exercise training, and only nine studies appropriately reported more than half (i.e., four or five of the six) principles. Lack of attention to principles of exercise training may result in an underestimation of the true benefit that exercise may have at a larger population level. From a practice standpoint, inattention to training principles leaves the fitness professional without the information s/he may need to prescribe a training program for an individual client. When the exercise prescribed does not match the desired outcomes or inappropriate populations are selected (lack of attention to specificity), failure to see improvements in the primary outcome of interest may be due to the prescription chosen rather than lack of efficacy of exercise itself. In the papers included, we saw a substantial difference in attention to specificity between aerobic only (43%) and resistance only (100%) interventions. Body composition, and bone mineral density are key concerns for men with prostate cancer, particularly those on androgen deprivation therapy, and are a common target for exercise interventions. It is well known that weight bearing exercise, specifically moderate-high intensity resistance training is required to elicit changes in bone mineral density in healthy populations . A popular type of exercise that is known to reduce fatigue during prostate cancer treatment is walking, but this modality would be ineffective if the goal were to prevent ADT-induced bone loss. Thus interventions who chose aerobic exercise only for this purpose were assigned a NR for this principle. In this review, specificity was appropriately applied most commonly, and is a more easily determined component of the prescription and should be continued in future trials and in translation to practice. The principle of progression considers that as the body adapts over time to the training stimulus, in order to see clinically meaningful improvements, and continued improvement and maintenance of outcomes over time the training volume (intensity, frequency and duration) must continue to be altered over time . In this review, just over half of studies included adequately reported progressive exercise prescriptions throughout the intervention period. Progression, and specifically the rate of progression of the exercise prescription is also important to note from a safety perspective. This information is critical for exercise professionals, as translation of exercise into community- or clinical- settings should be based on the RCT evidence accumulated to date. Progression that occurs too quickly could result in increased risk of injury, and too slowly could reduce efficacy, and lead to frustration and ultimately lack of compliance if individuals fail to see results. Similar to our previous reviews, we note that resistance training interventions are typically better at reporting progression in their prescription than aerobic interventions. This may be due to the perceived ease of instruction and recording of increased resistance weight. Although there is a reasonable upper limit to aerobic exercise frequency and duration that individuals will be able to complete from a logistics perspective, progression of intensity of exercise, through either heart rate target or RPE is important to elicit an adequate training stimulus. Equally important considerations in ensuring that an adequate exercise stimulus or dose of exercise is delivered in order to expect improvements in a particular health outcome are the related principles of overload and initial values. Each of these principles were adequately reported by roughly half of included studies. To ensure participants experience gains in physical fitness, it is essential that exercise interventions be prescribed at a higher volume relative to measured baseline levels. Without knowing whether or not adequate overload was applied relative to an individual’s initial value of an outcome, participants may be prescribed less activity than reported at baseline, which introduces the potential for detraining during the intervention. On the other hand, a participant could receive a prescription that is too vigorous for them increasing the risk of adverse events or dropout. The population of men with prostate cancer represent a heterogeneous group; they tend to be older, have a variety of comorbidities, be physically inactive and receive treatments with side effects that accelerate age-related fitness declines. Given this, as well as individual differences in responses to exercise, prescribing exercise relative to a man’s starting capacity is critically important. In this review, no study evaluated the principle of reversibility, and only 28% of studies examined the principle of diminishing returns. Understanding the trajectory of change over time in expected outcomes across an intervention is necessary to ensure that adequate overload is maintained by progressing the training program. For example, in resistance training interventions men will increase muscle strength over time such that a given weight represents less of their maximum capacity (e.g., 1-RM) and thus weakens the training stimulus. Knowing that diminishing returns is likely to occur, particularly in longer intervention periods, investigators and fitness professionals should build in periodic reassessments to recalibrate training volume. Measuring and reporting on these components may be logistically more challenging during an exercise intervention, as multiple time points of assessment are needed. When a full outcome assessment is not feasible, we urge investigators to consider the use of a shorter test battery or even proxy measures of the outcome of interest (example self-report body weight vs. in-person weigh in) at time points throughout the intervention to help us to better understand trajectory of change and adjust the exercise prescription as needed. Reversibility is also a challenging principle to attend to, especially outside of the context of a supervised intervention. Reversibility of training effects may occur when a specific intervention ends and participants do not continue on their own, or due to lack of compliance during the intervention period. Understanding the long term effects on relevant outcomes after an intervention, particularly a supervised intervention, ends is important for the translation of research to practice. Knowledge of these aspects will help improve exercise prescription from an exercise physiology perspective, but may also inform incorporation of behaviour change techniques for long-term maintenance and sustainability. One consideration that must be made when interpreting findings from this review is that study authors were not contacted for missing data. With respect to the attention to principles of exercise training, some of these studies may have carefully considered these in the design of their intervention but assigned a rating of unclear or NR in this review. We strongly urge all authors of exercise trials to carefully report all details of the intervention. Given that online appendices or supplementary materials are now common in most scientific journals, there is a greater opportunity to report these aspects in future studies while still adhering to strict word and page limits of the articles themselves. We also recommend authors follow the guidelines published in the recently published Consensus on Exercise Reporting Template (CERT), including the frequency, intensity, duration and type of exercise prescribed under section 13, “When, How Much” and exercise actually completed under section 16, “How Well: Planned, actual” . As the evidence base for the effect of exercise in men diagnosed with prostate cancer grows, it is important for researchers to apply the basic principles of exercise training in the design of their intervention, and to fully report all components of the exercise prescription (or dose) assigned and received, in order to continue to move the field of exercise oncology forward. This will allow better translation of evidence-based research into clinical practice and allow for greater fidelity of the anticipated response to a prescribed exercise program. SNS is supported by a postdoctoral fellowship from the Canadian Institutes for Health Research. The funding body had no involvement in the study design, analysis or interpretation of data. KWS and KLC conceived of the original review. SENS conceived of the update. SENS and MM screened references and extracted all data. SENS drafted the manuscript. SENS, MM, KB, KLC and KWS critically reviewed the manuscript and provided final approval.